The forest is still ringing. Flashbacks of fairies, lights and lasers projecting from trees hovering over glistening elephants come and go. Eight days of magic did not suffice. In the small town of Rothbury, thousands of people swarmed acres of campgrounds to unite alongside curated electronic acts and stunning works of art to what they called home. 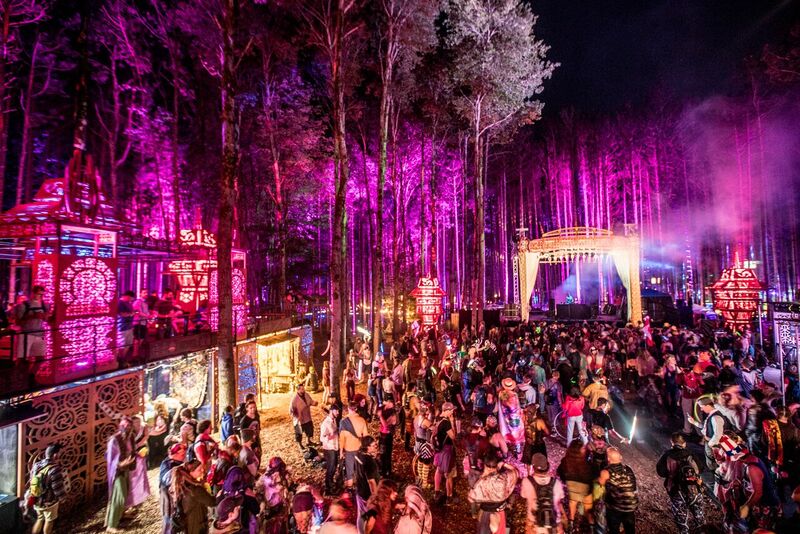 Since its debut in 2008, Electric Forest has grown at an outstanding rate, demanding the festival to expand from one, to two weekends of insanity. With heavy headliners, fans quickly sought out their tickets to see acts such as; Bassnectar, Above & Beyond, The String Cheese Incident, and Odesza. The sold-out first weekend was just as jam-packed and breathtaking as the second. Held in a resort, the acres were vast and offered an array of activities and vendors alongside performances to stay entranced. Shuttles helped transport campers around the many campgrounds. There was even an indoor water park welcoming those seeking a quick plunge. In true summer fashion, showers crossed skies leaving muddy dance floors that no one seemed to mind. In the entrance, Mystical arches welcomed enthusiastic fans from all places. The first spectacle was the beautifully sculpted Tripolee stage. Over the weekend, many artists passed by and threw down some magic but kicking off the first of EFs 2017 curated events was Claude Von Stroke’s label party ‘The Birdhouse”. Performances by Claude Von Stroke, Golf Clap, Sonny Fodera, Jimmy Edgar, Machinedrum, Walker & Royce, and Maya Jane Coles. Heatwaves protruded from the Jubilee Tent, mostly from the fire beats. Highlights included “This Song Is Sick” secret sets from Autograf, Louis the Child, Ganja White Night + Boogie T, and peaked with Big Gigantic + Illenium + Ekali collaborating on stage. Not too far off, countless hammocks surrounded the Ranch Arena. This stage welcomed some of the biggest acts including Dillon Francis. Flume and Big Wild. Highlights included a ginormous “Roo Shoot” that welcomed everyone to join a dance party under a rainbow, kindergarten inspired parachute to the funky sounds of Breakbot. Of the most memorable was a four-hour set by The String Cheese Incident welcoming incredible collaborations by Kamasi Washington, Matisyahu, Matt Hill of The Floozies, Break Science, Brazilian Girls, Liquid Stranger, and Eric Krasno during weekend one. During weekend two, the group performed a culturally and politically emphasized show focusing on the resistance of oppression by overcoming with love titled “Lead with Love.” The EF veterans incorporated spray-painting protesters on trampolines, neon SWAT teams turned drumline, a search helicopter showering the crowd with heart confetti and a flying Lady Justice alongside a firework finale. Not too far off and through the forest, Sherwood Court had a party going on. With the help of thousands of flying glow sticks illuminating the sky, TroyBoi, EOTO, Lotus and friends lit up the place. However, the best part of this stage was getting there. In 1952, Wally Wojack decided to plant a forest in the middle of JJ Ranch. 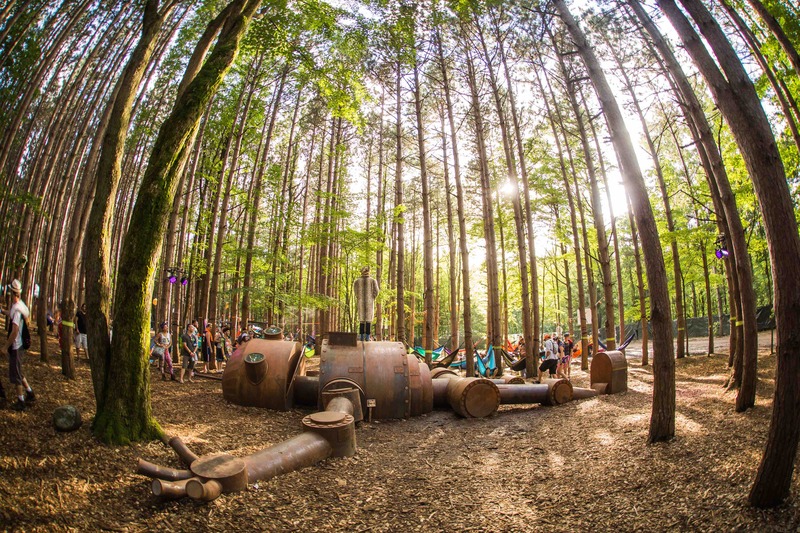 Thousands of picturesque trees have grown into what is now Sherwood Forest, the most distinctive element of Electric Forest. It’s home to dozens of art installations for visitors to explore and admire. Little mushroom houses, beautifully adorned fairy-like cottages, hanging orbs, swindling umbrellas, ginormous tree houses, wishing wells; it’s better than any theme park you can imagine. Featured this year was the Caravan Elephant centerpiece, a real sized elephant that at night had projectors that would vibrate different patterns on the figure. Little mushroom houses, beautifully adorned fairy-like cottages, hanging orbs, swindling umbrellas, ginormous tree houses, wishing wells; it’s better than any theme park you could imagine. Featured this year was the Caravan Elephant centerpiece; a real sized elephant that at night had alternating projections vibrating surrounding the textured figure. Apart from detailed surprises at every tree trunk, the forest hid stages and a silent disco among a few other gathering spaces. The Forest Stage was very much alive with sets from Thriftworks, A-Trak, DJ EZ, Shiba San and others while a two-story tree house served as a trading post. Live art could be admired from The Observatory while live instrumentals filled the air. The art didn’t stop there. One of the largest structures in the venue was The Hangar. 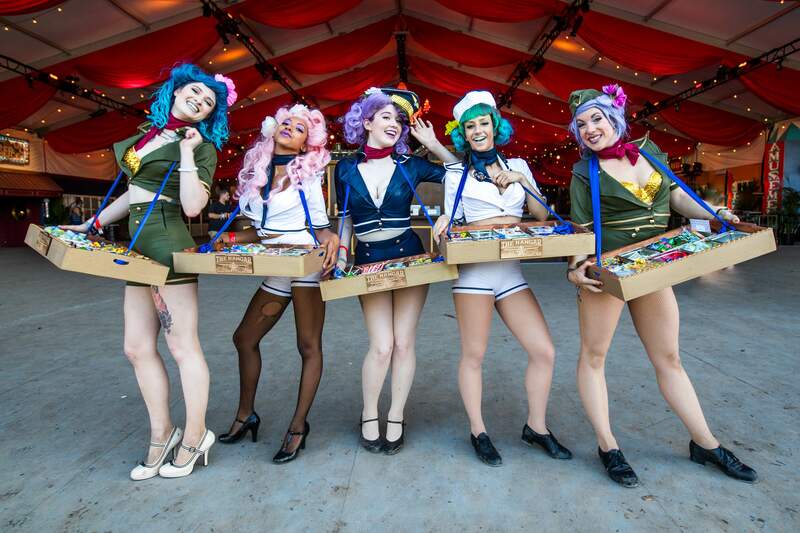 This post-American war era inspired building hosted burlesque shows, New Orleans brass bands, and other performances while pin up girls walked around selling sweets. What made it truly particular were the themed shops inside displaying titles suggesting a tattoo parlor, braiding salon, barber shop, an all out game hall and a top notch liquor bar. Aside from amazing entertainment and visuals, EF brought together an extraordinary community of people while promoting sustainability and self-growth. The recycling incentive “Electricology” encouraged visitors to properly trash in recycling areas. In return, volunteers would get points to redeem for merchandise. With the goal of empowerment, support, comfort, and solidarity for women in (but not limited to) the festival community, “Her Forest” welcomed all. The group held a dedicated camp, a five-hour curated event, panel discussions, meetups, women’s circles, and a Meet & Greet with the Production Women of EF. Needless to say, Electric Forest 2017 topped prior years. “It was amazing to see such a diverse community come together to create art, appreciate all kinds of music, and transform the unique campgrounds into their temporary home,” stated Pasquale Rotella; Founder and CEO of Insomniac. EF was seamlessly able to deliver a sense of unity and adventure. Yoga in the morning, hot air balloon rides during sunset, and fast paced Ferris wheel rides at night while everyone around you was greeting each other with a “Happy Forest”. This was easily the most commonly spoken phrase throughout the weekend.